In the previous article of this series, I talked about how by understanding Puppy Learning and Behavior we can teach our puppy the appropriate ways to achieve his needs and wants. 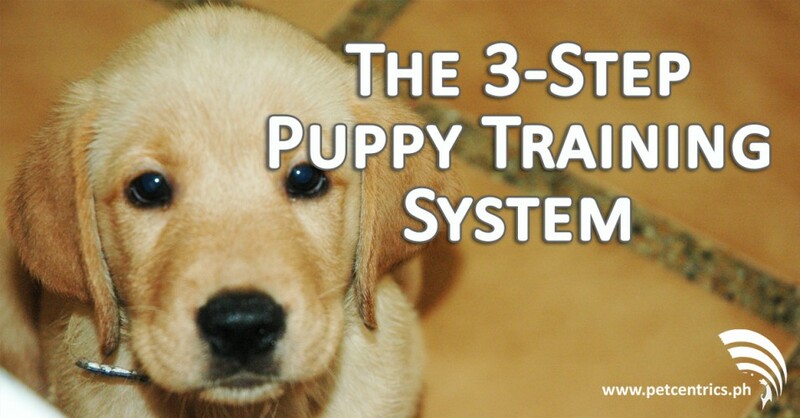 Today, I’d like to share with you the Pet Centrics 3-Step System for Puppy Training, wherein you’ll begin to understand how to prevent bad behaviors from being learned, and how to go about training your puppy his first lessons in Basic Obedience and Home Manners. The very first thing you need to do when training your puppy is to learn to effectively manage and supervise him. Management and supervision means you keep your puppy out of trouble and prevent bad behaviors AT ALL TIMES. You have to remember that in your puppy’s mind, behaviors are neither good nor bad. It is only we humans who label certain puppy behaviors as being bad because they are somehow disruptive to our daily lives. To a puppy, behaviors are classified according to whether or not they achieve a desired result: a need or a want. Reinforcement of behaviors happens when a puppy repeatedly achieves a need or want by performing a certain behavior, regardless of whether we think it is appropriate or not. Behaviors are reinforced if they repeatedly achieve a need or want for the puppy. Let’s observe what reinforcement looks like: In the table below, we have the puppy’s behavior in the first column, followed by the motivation for the behavior in the second column. The third column, lists the desirable result each behavior achieves for the puppy. I repeat: to the puppy, it doesn’t matter whether behaviors are appropriate or inappropriate. And this explains why management or prevention of bad behaviors is so important: Because if the puppy repeatedly produces a desirable outcome from doing a behavior that we perceive as bad, then the puppy learns the wrong lessons and habits. The more repetitions or the longer the behavior is allowed to go on, the stronger it becomes. It becomes more thoroughly reinforced. Once the behavior is reinforced you will have more and more difficulty training a puppy out of the bad behavior, and you will need to do twice the work of training in a new appropriate behavior. Inexperienced puppy owners, in particular, are horrible at providing an adequate amount of management and supervision, because they don’t know what to expect and how to prevent bad behaviors from happening. Owners fail to identify potential trouble spots or items around the house. Many puppy owners don’t take into account what the world looks like in the eyes of a puppy. Consider the example of chewing: In your puppy’s eyes, nearly everything has the potential to be a chew toy: footwear, furniture, electric cables, and what-have-you. So when puppy-proofing your home environment, remember that while the difference between footwear and a dog toy may be obvious to you, to your puppy there is no difference at all. Owners fail to provide hyper-vigilant supervision. Watching the puppy from the corner of your eye while your attention periodically strays to texting on your cellphone, or watching a video on your laptop is NOT what you can call being hyper-vigilant. If you are tasked to watch your puppy, you must watch him like a hawk, follow him around every corner, and never let him out of your sight. Mistakes can happen in a split second, and it’s absolutely important that you are there to prevent them before they happen, or to quickly intervene and put a stop to any naughtiness the instant it begins. If you are unable to provide supervision at certain times, make sure your puppy is crated or penned where he cannot get into any trouble. Owners rely on the puppy learning his lesson through punishment. Waiting until your puppy makes a mistake and then punishing him for it is a poor way to train. Some puppies don’t mind taking whatever punishment comes, so long as they were able to achieve their need or want. For instance, to some puppies, getting punished for chewing on a slipper might be worth suffering the owner’s wrath for a few minutes. Furthermore, if you reprimand your puppy after he’s chewed up your shoe, your puppy might stop chewing that particular shoe, but it doesn’t necessarily teach him to stop chewing on other things he’s not supposed to chew on. Owners end supervision too soon. Don’t make the mistake of believing that just because your puppy has been behaving well for a few days or even weeks it is now safe to let him have free run of the house. One mistake can cause a quick regression into bad behaviors that will be difficult to undo. For some, supervision may need to last for many months even into the early years of adulthood before you can say for certain that your dog is reliable to be left alone. Always remember that you cannot successfully train an appropriate behavior to become habitual to a puppy if, alongside your training, your puppy is still allowed to engage in naughty behaviors that allow him access to his needs and wants thereby reinforcing the naughtiness. Once you’ve done your job of properly managing and supervising your puppy, you can redirect your puppy to more appropriate choices, that is, choices that are not destructive to your home or disruptive to your lifestyle. These choices should have value to the puppy in that they satisfy his need or want in a particular situation, and they should be rewarded frequently. Redirection may be done by simple and straightforward physical redirection. For instance, if your puppy needs to satisfy his chewing habit, only make accessible those items which are appropriate chew toys. Make these chew toys appear valuable or enticing to the puppy by filling them with treats, or infusing them with certain tasty scents. The reward accessed by the puppy is provided by the act of chewing itself, as well as by the bonus of treats that fall out of this loaded chew toy that you have provided. While some redirection can be achieved as easily as providing other more appropriate activities, or taking him somewhere where he can’t get into trouble, in some cases you will need to actively teach your puppy specific behaviors that can replace the inappropriate ones. This is where training as described below comes into play. Some behaviors that are desirable or appropriate in our eyes, do not come naturally to the puppy. Sitting for attention, for example, is something that is counter-intuitive to a puppy. The natural behavior of puppies when they are interacting with other dogs is to seek attention through facial proximity and by licking the mouth and lips of their parents. Therefore, when puppies are interacting with us to get our attention, their natural tendency is to jump up on us to get close to our face. This may be tolerable or even acceptable coming from small puppies and toy dogs, but jumping up for kisses might not be so adorable if coming from, say, a 30kg Labrador or Golden Retriever, or if your dog just came from running around in the rain or wet grass. So, in this case, it is beneficial for us to spend time training a dog to request for attention by quietly sitting on the floor in front of us. Asking dogs to perform behaviors that go against their natural inclinations is similar to us asking them to speak another language entirely. Fortunately for us, most puppies are fast learners. As soon as you remove rewards for what we deem is inappropriate behavior, and teach which behavior is more likely to get him what he wants, your puppy will begin to resort more to presenting the rewarded appropriate behavior until the inappropriate behavior fades entirely. Outside of the 3 steps I have discussed, an additional point I want to touch on is how to handle situations wherein your puppy makes a mistake. After all, it is inevitable that, at one point or another, you will encounter some kind of failure or breakdown in training. Your puppy might pee in the wrong spot, chew up a shoe, or steal food from your table, etc., etc. If so, what then should you do? It does no good to fly into a rage. Some puppies may cower in fear of you if you yell, grab them by the scruff, or threaten to beat them with a slipper. But while this may appear an effective way of stopping the bad behavior, it loses you points where trust and relationship are concerned. In addition, punitive punishment may have some very serious consequences. Depending on what naughtiness was committed, if caught in the act, you might either use a verbal or audible interrupter to startle the puppy out of continuing with the inappropriate behavior then redirect him to a more appropriate activity; or you may, as calmly as possible, approach your puppy and remove him from the crime scene, or remove any stolen object (especially dangerous or toxic ones) by gently prying it out of his mouth. If you did not catch your puppy in the act, and the crime was committed with minutes or even hours gone by, then there is no use making any big deal out of the event whatsoever. If you reprimand or punish your puppy at this point, it is unlikely that your puppy will associate the punishment in any way with his naughty act. Simply clean up the mess, make sure the puppy isn’t able to do it again and move on. In cases where the puppy might have eaten something detrimental to his health, however, it is important to investigate the crime scene and the puppy in greater detail. What information should you take away from your puppy making a mistake? First of all, you have to accept that the mistake might not have been wholly the puppy’s fault but yours as well. In the face of failure, analyze what happened: Where did the breakdown of management and supervision occur? Was the puppy left unsupervised in an area or around objects where he could have gotten into trouble? If yes, then you must immediately step up your supervision of your puppy to prevent re-occurrence of the slip up on your part. On the other hand, if the puppy was supervised, were you physically strong enough, or fast enough to control your puppy and to intervene before he got himself into trouble? If no, then it might be necessary for you to use special training equipment to help you control your dog. COMING UP: In my third and final article in the Puppy Training Prep series, I’ll help you get into the proper mindset in order for you to achieve puppy training success. I’ll also share with you the story of one of my students and their experience of training with me and using my system.